Nicole's Needlework: Hormones!!! Watch out!! In the past couple of days I've become a huge ball of crazy hormones. I've been nesting like crazy and god forbid if a kid (or husband) leaves something on the floor they'd better watch out! I can't stand to be around myself right now! Oh and I've been crying over every little thing also! If dh just uses a wrong tone of voice I become a blubbering idiot! I need help - I need to be isolated until I give birth, which is hopefully soon, but not this weekend because dh is going to Florida again until Tuesday! Pic is a little more yellow than it actually is. My camera likes to make things yellow (without flash) or gray (with flash) - I give up! :) Well, I'm feeling calmer just writing this. I'm going to stitch now and watch my Braves hopefully win another one! Write later. You're off to a great start on the Village - I haven't ordered it yet, but plan to soon. Good luck with your hormones. Please post as soon as you can after the baby arrives! We'll all be thinking about you! Hi Nicole--Yours looks great! I hope to make more progress on mine this weekend, but I also need to finish a birthday gift! When is your baby due? It must not be too comfortable stitching right now?! Love your start on the Village, I havent ordered yet either but I really need to soon. 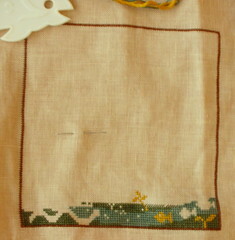 What a great start Nicole, I love seeing this project coming alive on fabric. Good luck with the hormones :), I hope the baby will arrive soon (though not too soon). What a great start! Can't wait to see more. I hope your hormones settle down soon. Oh, I really wish I had my supplies! You've made a great start Nicole - looking forward to seeing your continued progress.